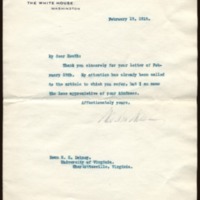 Woodrow Wilson thanks Richard Heath Dabney for notifying him about an article. Thank you sincerely for your letter of February 12th. My attention has already been called to the article to which you refer, but I am none the less appreciative of your kindness. Wilson, Woodrow, 1856-1924, “Woodrow Wilson to Richard Heath Dabney,” 1915 February 13, WWP20504, University of Virginia Woodrow Wilson Letters, Woodrow Wilson Presidential Library & Museum, Staunton, Virginia.